One of the most common questions I get asked is, "Dan, what is your favorite machine?" Before I tell you what my favorite machines are I should clarify that the machines we sell range from $200 to over $10,000, so I will give you my top picks based on price range categories. Remember that we can carry any make or model machine available. I have carried a few brands in the past that I don’t carry now. I am not going to give you my opinion on machines that I do not carry. Just know that if I don’t handle a particular line or model of machine, it is because there is something significantly better. My dad, Ramon, was a Chief Design Engineer educated in Switzerland. Not a day went by without him pointing out everyday products that were beautifully designed and manufactured with high quality materials. He also never hesitated to express his displeasure with cheap and poorly designed products. I followed in his footsteps and majored in Engineering, and now a day doesn't go by without me pointing out to my 2 sons the very same observations. Now, with 29 years in the sewing machine business, having sold over 13,000 sewing machines and repaired over 30,000 machines, I think my words will ring true. 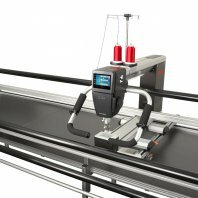 Our reputation for customer service and technical know-how allows us the ability to represent any sewing machine line of our choosing. There are many brands that we do not carry that are very good but not great and that is what we strive for as a company. We want to be the best! Currently we have chose the following brands based on Quality, Innovation, Value, and Reliability. In addition, the following companies support us in a way necessary to take care of our valued customers. 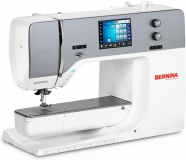 Bernina: This Swiss company is the only family owned sewing machine manufacturing company left in our industry. They still produce a limited number of machines in Switzerland but most of their machines are now manufactured in their solely owned and operated factories in the far east. What is important to remember is that their machines are very unique compared to all other manufacturers in that their machines still use an all-steel front loading bobbin system. 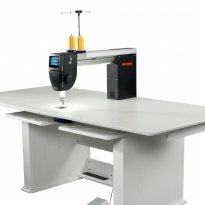 Three distinct front-loading designs (CB, Rotary and B9) give the Bernina owner a very unique sewing experience and feel. The machines are very sturdy with an almost industrial/commercial experience. They combine this traditional old-world feel with incredible innovation -such as their BSR (Bernina Stitch Regulation) for free motion quilting, Built-In Dual Feed, Over-sized bobbins and more. . Bernina owners are among the most loyal and I can see why but Bernina machines are not for everyone. All other machines are top-loading drop-in bobbin machines which are very nice. As you try these out (Janome, Babylock, Viking, Pfaff, Singer, Brother etc...) I think you will experience a similar feel to all of them. 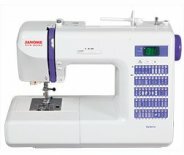 Janome: Janome is a Japanese company with a long and rich history. For many years their machines were branded New Home in the U.S. market. 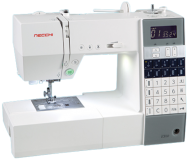 You will also find Janome built machines branded under the Necchi, Elna, and Juki name plates. We are now stocking and recommending some Necchi models in select categories. 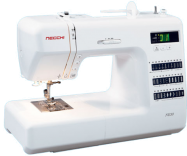 Simply put, they make the most trouble-free sewing machines in the world. Their electronics, including circuit boards, display panels etc., are by far the most reliable. Some might say this is my opinion but I say it is a fact based on 27 years as a chief technician. Any sewing machine retailer that tells you differently is not telling you the truth. 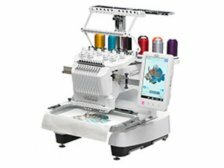 Babylock: We LOVE their sergers and their embroidery machines. 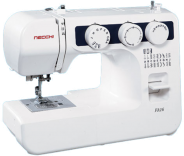 Their sewing machines are also very nice and reliable. 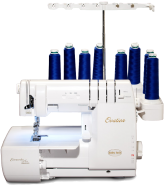 Their sergers are amazing; featuring jet-air automatic threading and thread delivery which eliminates tensions all together. Ninety percent of all the sergers we sell, and we sell a lot of sergers, are just two Babylock models. These sergers are built in Babylock's own Japanese factory. The quality is "off the chart!". 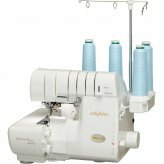 Unlike the sergers, many, but not all of Babylock's premium sewing and embroidery machines are manufactured by the Japanese company Brother. 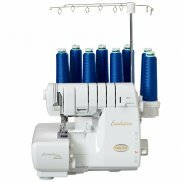 Janome and Babylock represent the best in top-loading bobbin design. They are like the Toyota and Honda of car companies. Both manufacturers are constantly competing, which keeps raising the bar for innovation and quality. Because of the similarities in the two brands, it is hard to choose which is best. Generally speaking, I prefer Janome quality a little more, but it is certainly not enough to take me away from my preferred embroidery machines, which is the Babylock. 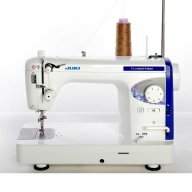 Juki: Juki is primarily an industrial sewing machine company that has recently introduced household machines into the US. They are not widely known, but I love them and they represent an incredible value. 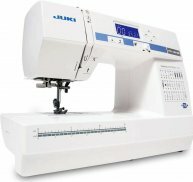 We currently carry four Juki home machines (1 sewing machine, 2 sergers, 1 semi-commercial straight stitch machine, and 2 quilting machines). 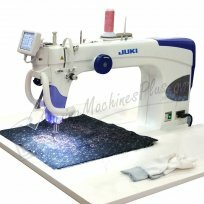 We are also an authorized Juki industrial sewing machine dealer and stock many common machines for the professional sewer. Before We Look at Dan and Marty's 2017 Picks: Please realize that no machine is any good if you do not have a dealer that you can trust . Make sure that they value your business and have the technical know how to support the machine you just purchased. Do they include classes? Do they do their repairs themselves on-site? Will they be around next year when you need them? I do not recommend that you buy your machine on-line UNLESS: You have no dealer close to you, you do not trust your dealer, or they do not carry the machine you want. If you are unsure of any of these things, Please call or email me at dan@sewingmachineshop.com, or call me at ph# 925-937-7575. I will be happy to share my experience and opinions. Cons: Unattractive purple and white color, discontinued model. Cons: Dual feed system not as nice as Bernina 7 series, Not embroidery upgradeable. In this category, I suggest you try both machines because they are so different from each other. 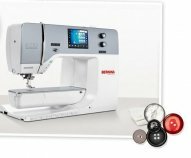 I tend to recommend the Bernina 790 if you are primarily sewing or quilting and doing a little embroidery. 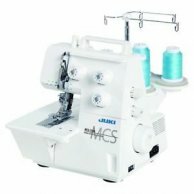 I will recommend the Destiny II if you are mostly doing embroidery and sewing less. One thing I can guarantee is that these are both amazing machines and you cannot make a purchase mistake with either one. This is the easiest recommendation I can make. Get a Babylock with Jet Air or" Extraordinair" threading and Thread Delivery! You cannot get these 2 important features on any other machine or brand. 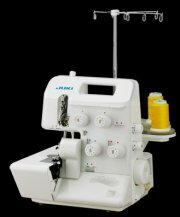 Juki makes a serger with jet air threading but not thread delivery. Thread delivery is the complete elimination of tension dials. In fact, it does not work on the tension principle. 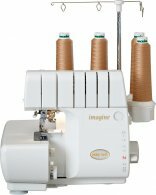 It delivers the exact amount of thread that you need to get a perfect stitch no matter what brand or type of thread that you are using. It is ingenious in the fact that there are no electronics or circuit boards to perform this function. Purely mechanical, low-tech that works every time. The machines are Japanese built and last for years without issues.